There are supposed to be two guarantees in life: death, and taxes. I think they missed one: airline delays and cancellations. 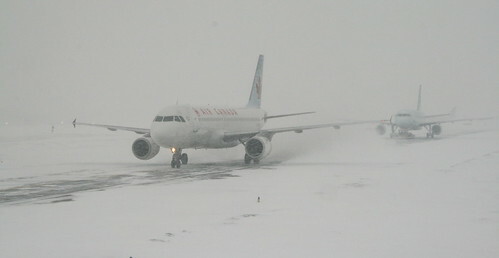 As our recent “snowstorm” – and our upcoming thunderstorm season – prove, airlines can cancel flights for just about any reason. Snow that might appear? Canceled. Too much wind? Canceled. Plastic bag blew on to the runway? Canceled. Okay, so now what? Here are a few ideas I’ve compiled to help you get through the fun of airline cancellations. Get on the phone. At the first notice the flight is about to be cancelled, get on the phone. If you are sitting on the plane, this counts double. When it comes to rebooking, all computers are the same. So don’t wait for the overworked gate agent to rebook you. Call a reservation agent (with access to a computer) and get as close to the front of the line as you can. Reserve your “last chance” flight. After your flight has been canceled, you first goal is to get a confirmed reservations on some flight in the future. This flight is your “last chance”. If nothing else works, this is the flight you are guaranteed to be on. Get the best flight you can, but make sure you get a guaranteed seat on something. Don’t argue with the reservation agent about this flight. Ask for all the options, and pick the best one for you. Remember, the reservation agent can’t see anything other than a computer screen. Use this opportunity to make a good backup plan. When making this change, stop to think about one thing. If your flight was canceled due to a storm, dont fly to another nearby city during the same storm. There is always the chance they will cancel that flight too, and that puts you even further in to trouble. Try to get a flight that avoids the delay, either later or to somewhere not affected. Of course, this doesn’t apply if your flight was canceled due to a mechanical problem with the plane. Check with other airlines. Although most airlines won’t tell you this, it is possible to take another airline (known as a “carrier”) to your destination. Call the other airlines, and see what they have available. If you find something better, call your airlines reservations line and ask them to rebook you on the other carrier. Make sure you have the flight numbers on the new carrier, so you are sure to get what you want. Go standby. Now that you have your “last chance” option in place, it’s time to see if you can do better. The best way to do this is to get on the “standby” list of every flight you can to your destination. Passengers are always missing flights, changing times, or maybe the connection didn’t come in. Each of those is a chance to get a seat on an earlier flight. Take all the chances you can get. Once you ask to be on the standby list, your name stays on the list for all the next flights. You can check if you want, but be polite about it. The airline will usually “carry” the standby list forward to each later flight, so start by saying “just wanted to check”. If you are going standby, try to get the non-stop flight. If you must take a connection, realize that you could get stuck in the connection city. Be prepared for this – because the airline won’t give you a hotel room if you can’t make it the rest of the way home. I also have a few other thoughts that might help. Remember that airlines aren’t the only way to get home. I’ve flown to Philadelphia, Newark, and JFK in an effort to get back to DC. Once you get to either Philadelphia or New York, you can let Amtrak take care of the rest. Amtrak doesn’t mind rain or fog, so it is a much safer bet than waiting out a storm. Thanks Amtrak! Finally, the best advice I ever received on handling a cancellation is to “get a good book”. Patience is the best way to get out of trouble. Be prepared to spend some time in a seat, and just relax. You’re likely to be in good company – lots of people are going to be waiting for the same thing. I’m always looking for good alternatives, so if you have any good tips or tricks please share! came to DC, left for San Francisco, and then realized he couldn’t live without a daily fix of politics and came back. When not traveling to crazy locations, he speaks and writes for a major software house in CA. I just wanted to echo the comments “When it comes to rebooking, all computers are the same.” When faced with a cancelled flight I have gone to other gates that were basically empty and asked the agents there to rebook my flight. Most are helpful and will give you the same options as the agent at your cancelled gate, just minus the line. 1. If you are a frequent flier you usually have a separate reservations number – put this into your cell phone before you fly so you can call that number first. Usually they pick up faster and will do a bit more for you that the regular line. 2. Remember that airlines generally see IAD, BWI, and DCA as all the same. If its mechanical issues, get on the next flight to any of the three. With weather, generally DCA is out first, then IAD, and in the case of thunderstorms BWI can be separate than IAD. Pardon my (understandable) home-crowing, but Denver is an excellent hub if you have to do one. One of the main industries in the Denver area has been air transport, due to its more-or-less central location in the country. The airport is large, easy to move around in (security lines can be long, beware), and has a large number of hotels and such nearby in the event you have to wait until the next day. United runs a large number of flights out of there, and Frontier uses it as their main hub, for a couple of examples. Your options are much greater from there than other nearby airports- very much worth looking into. I have to agree with you Denverite. I’m a United guy and while I’m all about direct IAD/SFO, I’ll take a stop-over in Denver. The airport is big and relaxed, the view of the mountains at take-off/landing is stunning,a n d best of all, I can switch out destinations. I often buy IAD/OAK or SFO/BWI and switch SFO for OAK or IAD for BWI and get my preferred airports at a cheaper cost. And I never fly ORD. I agree that Denver ia a great airport. The new large terminal has many options for food and it’s location away from the city means it has plenty of room for multiple runways and great traffic patterns. Two points about Denver. First, Denver is a major thunderstorm area. I’ve been delayed multiple times in the Denver airport for storms, although they tend to pass quickly. Second, the location of the airport means there is one cluster of hotels near the airport. But, if things get really bad, those hotels can fill up quickly. Worse, the next closest hotels are a drive away – and there are no mass transit options out of Denver. If I had to choose between Denver and Chicago, I would choose Denver every time. Chicago is almost as bad as Newark or JFK. came to DC, left for San Francisco, and then realized he couldn't live without a daily fix of politics and came back. When not traveling to crazy locations, he speaks and writes for a major software house in CA.